Ranaudo's battery mate, Christian Vazquez, took some time to talk with SoxProspects Staff Writer Tim Healey about his revamped approach at the plate. Former catcher and Sea Dogs hitting coach Rich Gedman also chimes in about the improvement he's seen in Vazquez. Following up on last week's story about the benching of Jose Iglesias, the Providence Journal's Tim Britton speaks with PawSox manager Gary Disarcina. Disarcina exaplains why he sat Iglesias and how giving the young shortstop time to reasses his situation has proven helpful. Britton also sat down with Pawtucket outfielder Bryce Brentz who talks about his offseason accident and how lucky he feels to be where he is following the ordeal. Wrapping up his Pawtucket beat, Britton also talks to the Pawtucket coaching staff about the progression they have seen in Rubby De La Rosa. Marc Normandin from Over the Monster catches up with Ryan Kalish and talks about how the outfielder briefly considered retirement after having a rash of injuries derail his career the past few seaons. The Boston Herald's Scott Lauber reported that the Red Sox are not ready to take any drastic measures with reliever Daniel Bard despite his recent control problems. After tossing a simulated inning yesterday, WEEI'S Alex Speier reports that Andrew Bailey will have a one game rehab assignment with Pawtucket before being activated by Boston. Speier talks with Garin Cecchini about his mother's influence on his development as a professional. A podcast with Garin and his mother (Raissa) is also available on the site. In some roster shuffling this week, Chris Martin was promoted to Pawtucket, and Jeremy Kehrt was assigned to Portland. 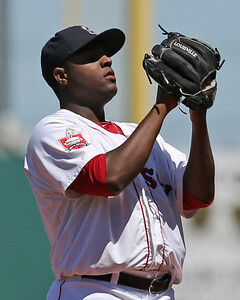 Brian Johnson, the Red Sox first round selection in the 2012 draft, earned his first professional win last Friday against Augusta. Johnson, 22, had his season cut short last year after being struck by a line drive. Photo Credit: Rubby De La Rosa by Kelly O'Connor.